These pages allow you to download new language specifications for MetaEdit+. The modeling languages supported are updated periodically, and thus if you do not find a specific modeling language contact us at metaedit.support@metacase.com. 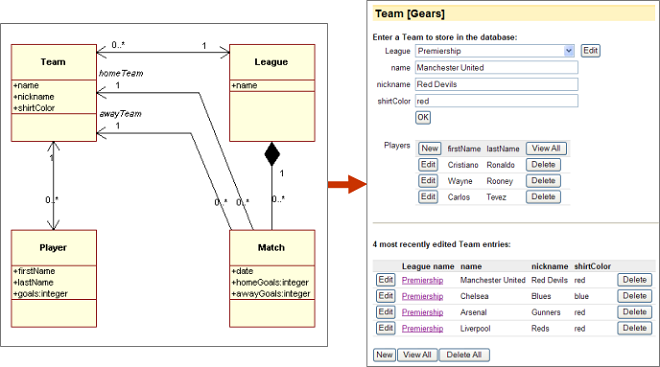 Also, if you have made your own modeling language with MetaEdit+, feel free to share it with others by uploading it to the Forums or emailing it to info@metacase.com. The Language Workbench Competition follows in the tradition of the earlier MDD-TIF07 by giving the same set of tasks to all of the metamodeling tools. Here are the PDF instructions for completing the tasks in MetaEdit+, and the LWC11.zip repository in which to carry them out. After 4.5 SR1, a new example has been added to support generating fully working web applications from UML diagrams. The UML language remains unchanged, but two new models (Football and Ordering) are added, along with a new generator, Web Application, and its subgenerators. The models and generator updates can be imported from the webApps19.mec patch. Instructions and documentation for this new example can be found in Web Application Example.pdf.